Hey there Stampers...I'm so glad you could join me on my blog! Today I've got some more 2-Step Stampinspiration for you from the Lots of Lavender set from the Sale-A-Bration flyer. Can you believe that Sale-A-Bration is almost over??? Time sure flies when you're getting free stuff, huh? Love it! The card layers here are just Very Vanilla on top of Very Vanilla. This is another clean and simple card that uses a lot of "white space". 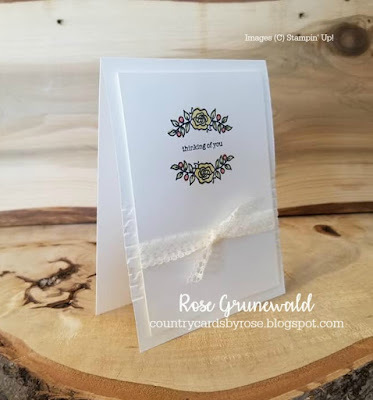 I embossed the card base with the vine & leaves embossing folder from the Petal Pair Embossing Folders in the Occasions Catalog. That Very Vanilla Lace Trim adds the perfect touch to the top layer, don't you think? 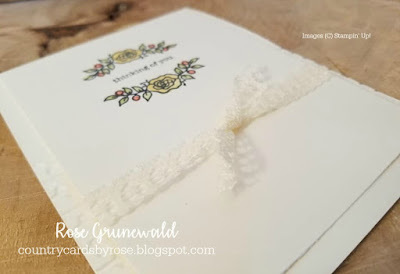 I just tied it in a knot - which is my favorite way to tie ribbon embellishments on my cards (you may have noticed). 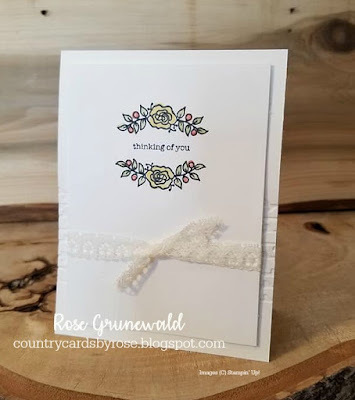 For the sentiment on this card, I use "thinking of you" from the Teeny Tiny Wishes stamp set in the big catalog. The flowers come from the Lots of Lavender FREE set from the Sale-A-Bration flyer. These are 2-Step stamps, so coloring is super easy! I love that!